When you think about science, what kinds of people are automatically associated in your mind? Are there people in lab coats and goggles, mixing together chemicals that may or may not explode? Maybe you pictured a man in a wheelchair inventing a computer. Was it a group of people with their eyes glued to a telescope? Usually the words “science” and “Christianity” are not very closely linked, but Dr. Jim Schmutz, former professor at Southern Wesleyan University, argues that the two topics are closer than the public collective might think they are. If we were to go back to the beginning of the Universe, how much time would we have to travel through? What would we see when it all started? Arguably the most important question is: did Someone Bigger put this all together? The Greek philosopher Aristotle was one of the Theistic contributors to the conversation about science and theology. 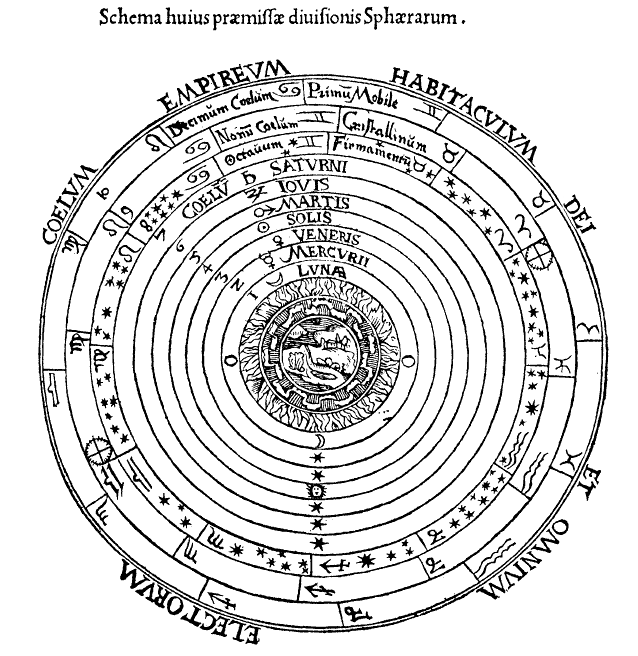 While he was wrong about the design of the solar system, Aristotle believed the Earth was at the center of everything, with the planets and sun orbiting and, just past the fixed stars, the dwelling place of God and the angels. Aristotle was misinformed about position, but not about content. I know this sounds a little bit fishy, but the validity of his process is reinforced by the detail that he at least had the correct order of sun and planets in reference to the distance from the Earth. Shown here is his model, which, other than the flawed placement of Earth itself, is accurate. Evidence that many different scientists have found points to the same origin of the universe that many Christians count as a hindrance: The Big Bang. 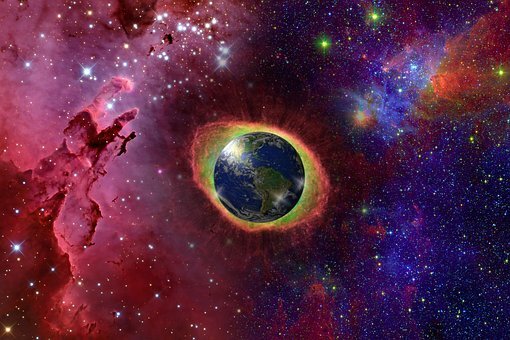 Christians believe that there could not have been a Big Bang is Creation had happened the way the Bible said it did, but Dr. Schmutz pointed out parallels in the Big Bang theory and Scriptures that suggest the Big Bang did happen and does support Christian beliefs. 2. This singularity expanded, creating all we see in the heavens including the Earth. 3. At the beginning the Earth was a loose cloud of coalescing matter. 4. The sun had not yet ignited. Jastrow was an agnostic, unsure whether or not there was truly a God, but the further he researched, the clearer it became that science supports the idea that there is a creator. There is no way to explain the specific orientation of the Universe and everything in it without recognizing that everything was put in place by a Creative Being. Before Dr. Schmutz came to speak to my class, I had no interest in accepting the Big Bang as something that could have actually happened. I was one of the people that could not understand that the Bible actually supports the theory of the Big Bang. I haven’t been totally stuck in a bubble; I can agree that micro-evolution is evident in life, but the Big Bang? It seemed ridiculous. After hearing Dr. Schmutz’s explanation, however, I came to the realization that everything I had been using to argue against the idea of the Big Bang was the very content that supported the theory. Obviously no one was alive when the Universe was formed, but the Bible gives humanity the closest and most descriptive picture of what happened that we ever could have hoped to ask for. The specific words “everything exploded into existence” were never used, but I believe that the context suggests that there very well could have been a big bang like scientists suggest. I think it would be safe to assume that when there was nothing, God speaking and something appearing was probably not silent. The sudden appearance of matter is no small achievement. Dr. Schmutz was very kind to enlighten our class on the possibilities of how the Universe was created. I think it is amazing that a person of faith is as educated as he is about the beliefs of all kinds of other people and how the facts of the scientific world do their part in supporting the ideals held by Theists and more specifically Christians. Information like this could provide opportunities for Christians to have conversations with non-believers about the facts that support Scripture, and an interaction like that is priceless. Dr. Schmutz is very qualified to speak on this subject as well. He received his PhD at Penn State and his Post-Doc at the University of Sussex in Falmer, England. On top of that, he taught Chemistry at Southern Wesleyan University from 1977-2009. The new information I have gathered from this experience will give me many opportunities for debate, but I would like to start as soon as possible! If you have an additional thought that would either support or object to the ideas Dr. Schmutz presented, please reply below! I would love the opportunity to continue to learn.